Spring is here and it is time to plant in Texas. Worm castings are rich in P,N,K but the most valuable component are the beneficial microbes that will add life to soil and plants. We have a ton of worm castings at our two Texas farms. You can pick up a 10 lb bag for $20. Add a handful of castings to seedlings or brew up your own compost tea to really get the most out of just a few lbs of worm castings. You will be surprised just how far a small amount worm castings can go. Here’s a video from a few years back where we brewed up 500 gallons with a combination of worm castings and compost. I had mentioned in my previous post that positive indicator for my compost tea application was to rid a section of our hay patch of ants. The spot of concern has been infested for a few years with “town ants” or Texas leaf cutter ants. 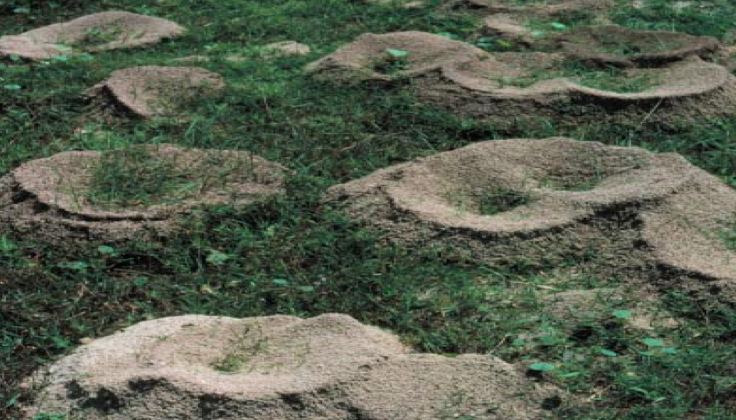 Town ant hills were sprinkled throughout a 20 yard X 20 yard area. The operative word being “were” because two weeks later the ant hills are vacant. Beneficial microbes in compost tea are parasites to ants, fire ants, fleas, ticks, and chiggers. I had had success in my lawn in getting rid of some of these pests with compost tea, but never on this scale. This alone is encouragement enough for us to continue compost tea applications, and we’re looking forward to the next batch. We ended up with two batches. In both we used @80 lbs of finished compost (40lbs in each of 2 mesh laundry bags that we purchased for $1.87 at Wal-Mart). Both batches we used 500 gallons of well water, and aerated with our 1600 gallon rated Aquascape 4 pond aerator. Where we tinkered a little was on the food source (molasses + brown sugar) and brewing time. 1st batch we used two jars of unsulphured molasses and 1 lb of brown sugar and 24 hours of brewing time. The color was light brown and the smell was pretty much neutral with a hint of earthiness to it. Batch #2 was brewed for 36 hours and was fed 4 jars of molasses and 1 lb of brown sugar. The smell on batch #2 was the same faint earthy tone with a hint of sweetness from the molasses. The color was a shade darker brown than batch #1. One thing we will be judging the success of the compost tea application on is in the reduction of ant hills. We don’t have a big fire ant problem, but one hay patch has several ant hills in an area. Adding beneficial microbes began for me as a way to control fire ants, grubs, and other pests in my yard, and have had some terrific results. We’ll keep you posted. Brewing a 5 gallon batch of compost tea is no trouble. In a couple of weeks I will kick it up a notch and be brewing up 500 gallons at a time. 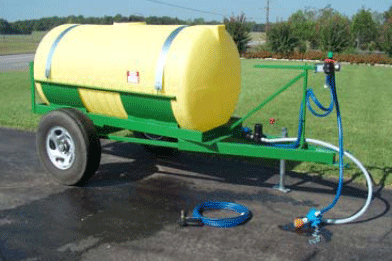 We purchased a 500 gallon spray rig from Rozell Sprayer Manufacturing Co. in Tyler, TX this Spring. In order to add beneficial microbes to our hay fields and pasture, I’m going to replace the water soluble fertilizer with compost tea. I don’t have enough compost to spread over 100+ acres, so compost tea is the solution. 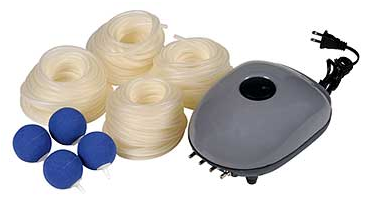 I just ordered my aquascape 4-stone pond aerator today, and this is what I will use to aerate my tea to ensure it stays aerobic. Most of the beneficial bacteria are aerobic and will need plenty of O2. To keep the ratio of finished compost to water the same as a 5 gallon brew (1 lb. -1.5 lbs. per 5 gallon) I am going to need 100 -150 lbs. of compost and some larger mesh bags. I am planning on using onion sacks for my tea bags.